Jack Hunter chose access over power. Now, he has neither. “Power resides where men believe it does,” says Lord Varys in Game of Thrones . The trappings of power can contribute to the real thing, but they can also conceal the truth. Radical Traditionalists and White Nationalists are under no illusions that the common people or even elected politicians hold the real power under our glorious democracy. However, power is also relative. Even a totalitarian dictator must confront the limits of his power. By any standard, financier George Soros has more power than just about any individual citizen, but all his wealth and might did not allow him to push through gun control . Similarly, a Senator like Richard Lugar  might have the connections and prestige acquired from decades of Beltway dealmaking and pushing through anti-white policies, but he was unseated by disgruntled conservatives from his own party. All the cries of the media elite and his own party leaders couldn’t save him from angry Hoosiers. A system such as ours is dangerous because the sources of power are diffuse and hard to track. Campaign donations, media bias, backroom connections, or even esoteric groupings are all sources of power that exist beyond the kind of informed and open decision-making that democracy supposedly rests upon. Opinion can be created, choice can be an illusion, and the spontaneous cries of the masses are often the result of an elite agenda determined long ago. However, our system is not completely closed, and important aspects are not fully under control. Especially at the local and state levels, grassroots organizing and political technology can actually empower citizens to displace mayors, Congressmen, and even Senators. While Radical Traditionalists and White Nationalists have no illusions that successful electoral campaigns can lead to systemic change, they can impose tactical defeats and strategic delays on the enemies who confront us. Mainstream politics will never save us, but it will always affect us, and revolutionaries have a responsibility to understand how it operates. Often, it is better to command campaign donations (or failing that, angry voters) than it is to try to manage a campaign directly or even run for office yourself. Something like the National Rifle Association has more power within in its field than any individual Senator, Congressman, or even President. Mainstream political activism is the effort to command sufficient political pressure to force politicians to do things they don’t necessarily want to do. A politician qua politician is defined by his ambition superseding his humanity. This includes his principles, if he has any. Existence in political office is life. Electoral defeat is death. Inflicting the political pain that could potentially lead to death – withheld donations, angry voters, negative press – is the realm of the activist. In the never-ending exchange between the grassroots and the politician, the successful organizer holds the power. The politician may have his hand on the button, but unless he wants to commit political suicide, he will do what the most successful activist tells him to do. Of course, Radical Traditionalists and White Nationalists find it difficult to overcome the academic, media, and financial establishment that render entire issues forbidden territory for mainstream debate. But even the question of what is considered “mainstream” or “fringe” can change with time. For the Left, gay rights is an obvious example of an issue that passed through the Overton Window  from “fringe” to policy in a remarkably short amount of time. For the Right, open discussion of the Federal Reserve (albeit without discussing who precisely owns it) has moved from the margins into acceptable political discourse. While some political change can come from within the heart of power – through bribery, intimidation, extortion, and skillful lobbying – most comes from the margins. An activist who commands angry voters in a politician’s home state has more power, in real terms, than any Congressional staffer or even a Congressman himself. Politicians have to manage activists – especially those from “their” side – if they want to stay in power. Thus, for the activist, the fateful day eventually comes when he is offered a job from inside the system. He will receive the trappings of power, the social status that comes with proximity to office, and the financial opportunities that arise with a job on the Hill or in a state capitol. However, if he accepts, the activist’s role is transformed. Rather than the grassroots representative to the politician, he becomes the politician’s ambassador to the grassroots. Rather than pressuring the politician to do what the grassroots want, his job becomes to convince the grassroots to accept what the politician does. The activist is concerned with what he can get. The staffer is concerned with what the constituents will tolerate. Which brings us to Jack Hunter. Jack Hunter, a.k.a. the “Southern Avenger, was a radio “shock jock” and political pundit who created a persona that mixed professional wrestling antics (such as a luchador mask with a Confederate flag design) with paleolibertarian  commentary. A member of the League of the South, a soldier in the Buchanan Brigades, and a supporter of Ron Paul, Hunter was typical of the early Ron Paul supporters that were the core behind what became an unexpectedly prominent and long lasting political and social movement. Americans, white or otherwise, don’t want Spanish-speaking people dominating their airwaves, neighborhoods, or country is no more racist than Mexico’s lack of interest in Seinfeld. . . . Native Americans had no illusions about how their land would change as boatloads of white men landed on their shores and modern Americans aren’t wrong to deplore the millions of Mexicans coming here now. A non-white majority America would simply cease to be America for reasons that are as numerous as they are obvious – whether we are supposed to mention them or not. Hunter’s lively prose and entertaining persona allowed him to ride the wave of the new libertarianism. Gradually, he became more prominent (and serious, donning a suit and tie), writing for websites such as Takimag.com and eventually The American Conservative and Tucker Carlson’s Daily Caller. More critically, Jack Hunter became closely associated with Ron Paul’s son, Rand, who was elected to the Senate from Kentucky in 2010 in an insurgent campaign that shocked the Republican Establishment. Hunter ghostwrote Senator Paul’s book and became an official part of Senator Rand Paul’s staff. Not surprisingly, the tone of much of Jack Hunter’s commentary changed. While Hunter continued to speak for insurgent libertarians attempting to seize the party from the “neocon war party,” Hunter also became an apologist for Senator Rand Paul against more anti-System libertarians. While Ron Paul refused to endorse Mitt Romney, Rand Paul did endorse the Republican nominee, and Jack Hunter defended this as a necessary step. 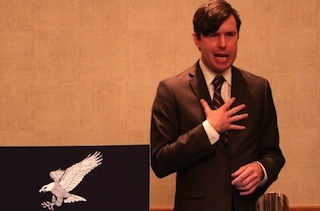 Jack Hunter lectured libertarians on the need to avoid conspiracy theories that would make them look extreme, notably 9/11 “Trutherism” and paranoia about the Bilderbergers. Hunter also softened his tone on immigration, declared support for gay marriage provided it was decided at the state level, and urged conservatives to avoid the “Culture Wars,” quite a departure from supporting the man who coined the very phrase. Some say Rand is not Ron because he is “willing to play the game.” That’s exactly right. That’s the point—to play it, influence it and win it as much as you can. The neoconservatives certainly do, to their advantage. Even Ron Paul “played the game” to some extent by becoming a Congressman, running for president and being engaged in practical politics. In the end, we’re all playing a “game” of some sort, even if it means trying to prove we’re the most pure in our ethos. The question is—is the endgame simply to satisfy our own egos? Or to achieve loftier, principled and tangible political ends? Of course it is worth noting that the specific policy that Hunter is defending in this case is Senator Rand Paul’s pronouncement  that an attack on Israel would be treated as an attack on the United States. This is a dramatic departure from the principled non-interventionism of Rand’s father and was seen as proof by many libertarians that the apple had indeed fallen far from the tree. In fairness, Rand Paul has reached  political heights undreamed of by Ron Paul. He came within a whisper of winning the influential American Conservative Union Presidential Straw Poll at the Conservative Political Action Conference in 2013, despite the obvious efforts of the conference’s organizers to dampen his vote. After feinting Left and garnering positive media, he voted against the Senate amnesty bill, skillfully positioning himself as the only anti-amnesty alternative among leading Republican presidential contenders. His filibuster against the drone assassination policy of President Barack Obama won him praise from powerful conservative voices like Rush Limbaugh, brought home many libertarians to the “Stand With Rand” camp, and divided his intraparty rivals Lindsey Graham and John McCain from the Republican base. As Jack Hunter put it himself, by couching libertarian rhetoric in conservative terms and avoiding offensive posturing, Rand Paul – and libertarians generally – were taking over the Republican Party from within. Yet the ultimate point of all of this has to be questioned. Taken at face value, Rand Paul has proven himself wobbly on the existential issue of immigration, and leads a movement that mostly sides with the enemy. On foreign policy, he has reversed his father’s position. After briefly questioning the Civil Rights Act of 1964 on libertarian grounds, Paul reversed himself when challenged and speaks passionately on the need to bring more non-whites within the Republican fold. On social policy, the moderation and nuance supposedly so in evidence on issues of race and immigration is nowhere to be found, as Paul aligns himself with the most reactionary elements of the Religious Right, inveighing against homosexual marriage and abortion and winning the straw poll at the Family Research Council. It’s not that Rand Paul is afraid to pick enemies among the rabidly pro-homosexual, liberal press – it’s that Rand Paul doesn’t feel comfortable doing anything that can be regarded as pro-white. For the principled libertarian, the dedicated white advocate, or the passionate non-interventionist, the only defense left of Rand Paul is that of Jack Hunter – he is “playing the game.” Put another way, he is lying about his beliefs in order to be elected, so that when he is President he will rip the mask off and give us a libertarian utopia of sound money, Constitutional Rule, and a restrained foreign policy. This alone justifies the Traditionalist critique of democracy, as those who would rule must consciously deceive those they seek to lead about their policies. As usual, White Nationalists remain some of the most gullible, stubbornly believing that Rand Paul is secretly “on our side” while his real policy is something closer to making sure the Third Worlders who inherit our country will use shiny stones as currency. We are asked to support a politician on faith, to actually hope that he is lying, and believing that he is deceiving everyone except us. To perform this act of faith is to voluntarily relinquish even the little power we still have. It is to trust in the fantastical hope of an otherworldly Messiah, who, against all expectations and history, will somehow heroically stand in defense of our people and their right to exist at the critical moment. After decades of disappointment and betrayal, we can not afford to be fooled again. But there is a more important objection to the “trust, but don’t bother to verify” strategy of those who seek to trade access for power. Though he would never put in these terms, Jack Hunter’s entire strategy is an attempt to “sneak up on the Jews,” in the same way that George Lincoln Rockwell  attempted early in his career. Though he may not realize it (or admit it), the “neoconservative tribe” behind the foreign policy Hunter rightly despises is far too alert to meet the fate of traditional American conservatives who found themselves outcasts within their own movement after the neoconservative takeover. That attack that destroyed Jack Hunter didn’t come from “antifa” or “civil rights groups” – it came from within the so-called American Right. The source of the attack was  one Alana Goodman, a cub reporter for the Washington Free Beacon. The Beacon is a “conservative” publication headed by Matthew Continetti, who is married to Anne Kristol, daughter of leading neoconservative William Kristol. The charges then were swiftly repeated  by the likes of Wonkette writer Kris Benson, who took a break from whining  about “white male privilege ” and wondering why too many white men have tech jobs. Wonkette of course is published by the tiresome cliché Rebecca Schopenkopf, who is still taking it out on whites for chasing her ancestors out of some shtetl in Poland. Mark Potok of the Southern Poverty Law Center made his appearance, and his duckspeak  style blog post was dutifully reprinted  by the content aggregator The Huffington Post. The Huffington Post’s editorial director is Tribe member Howard Fineman , who thought the story was so important he felt the need to weigh in with his own report . Once the “liberals” had piled on, the requisite concern trolling came into play. Jack Hunter and Rand Paul were condemned by self-appointed guardians of respectful conservatism, Jonah Goldberg of National Review  and Jennifer Rubin  of the Washington Post. This political hit – for what else can it be called – came after Rand Paul bent the knee, pledged fealty to the Jewish state, and went out of his way to kiss the ring of Bill Kristol and other leading neoconservatives. Nonetheless, this didn’t save him. Like the scorpion riding the frog, it is in the Tribe’s nature to attack  even when it is unnecessary or even to their own disadvantage – for there seems little possibility that the likes of Jeb Bush, Marco Rubio, or some other Israel First nonentity could win the allegiance of the American people anymore than Mitt Romney or Paul Ryan. The accusations of cowardice or willful stupidity come easy, but let us be charitable. Jack Hunter truly believes that Rand Paul can be President and he is willing to do what is necessary so as not to detract from his candidate’s chances. There is a certain nobility in this willingness to sacrifice – but there is also a great amount of naivete. The neoconservatives – let us be blunt, the Jews that run the American Beltway Right and control its financing – saw Rand Paul and Jack Hunter coming. They hate them not because Paul and Hunter are populist nationalists – they are not – but because they are not fully under control. That is enough for them to be destroyed. Like the aliens in They Live, the call goes out that “We’ve got one who can see,” even in some limited way. Even after publicly toeing the line, Jack Hunter and other kosher Constitutionalists received no mercy from the neoconservatives. The fate of Jack Hunter shows it is impossible to “sneak up” on the Jews. Nonetheless, Jack Hunter limps on, as does the libertarian insurgency within the Republican Party. Of course, the libertarian tendencies allowed within the GOP tend to be those that align with what would traditionally be seen as Left-wing causes – open borders, drug legalization, and gay marriage. Any “takeover” that would occur would be hopelessly compromised from the beginning. Furthermore, the neoconservative core perceive Jack Hunter, Rand Paul, and those like them as a threat. Those who lead the GOP are no more likely to allow Rand Paul to gain the nomination than the Republicans of the 1990s allowed Pat Buchanan. For the Republican leadership, political defeat is far more preferable than losing control of the American Right, even to the smallest degree. As a matter of objective political reality, it is far more likely that we will see an independent neo-Confederacy than the restoration of constitutional government following a democratic election with current American demographics. The Republican eEstablishment would much rather lose than allow someone they do not fully control to win. Nonetheless, Jack Hunter and his ilk will continue to tell us to trust them and their politician of choice and do whatever is necessary to secure political victory. The illusion of relevance, the trappings of power, and the excitement of the political horse-race will always tempt away would-be revolutionaries. But – what if they’re right? What is my analysis is utterly mistaken, and Rand Paul, against all odds, becomes President of the United States? Certainly, a President Paul would make a difference and like Pat Buchanan, he could unleash populist forces that couldn’t fully be controlled. Yet even if Paul is elected, as the Jack Hunter episode shows, it will be as a candidate either indifferent or openly hostile to white interests on immigration, civil rights, and other critical fields. Even in the utterly improbable event that he is elected, white Americans will once again be in the position of trusting in “implicit” identity signals and wishful thinking rather than possessing an authentic champion. If Paul and his team are willing to sacrifice whatever it takes in order to gain election, who is to say that Rand Paul 2016 would not be much the same as George W. Bush 2004? In our system, real power doesn’t belong with the politicians. It belongs with those limit their choices and guide their behavior. Our enemies control much of this power, but there are still openings for activists to make a difference. However, our activists need to understand that the System – and all those who operate to sustain it – are enemies that need to be replaced. Even those who operate within the system should only do so as a tactic to destroy the entire thing. In the end, the power we seek is the power to break away entirely from the System’s control. As unrealistic as that sounds, it is far more likely than somehow making the enemy’s System work for us, or winning a game where the rules have already been rigged. If Jack Hunter wanted to reclaim his power, he should reclaim the mantle of the Southern Avenger and start talking about those issues that made him popular in the first place. By harnessing angry voters, putting pressure on Southern politicians, and inspiring resistance to the Federal regime, he would be far more influential than in his current role as apologist for the libertarian wing of the Beltway Right. Ultimately, by leveraging his Beltway credibility into a role as an eloquent, reasonable spokesperson for Southern independence, he could even be a game changer in the current political debate. But let there be no confusion – his career within the Beltway Right has gone as far as it will go. He reached the same glass ceiling that awaits any conservative who shows – or who once showed – intellectual independence, creativity, or courage. Jack Hunter “played the game” – and lost. Like in War Games , there is only one way to win – not to play. We should participate in their system, but only on our terms. All political activism, whether it be “undercover ” work from inside the System or besieging it from outside must aim for the same goal – breaking the System entirely. Any activist who doesn’t recognize that isn’t just ineffective – they are not even in the struggle.